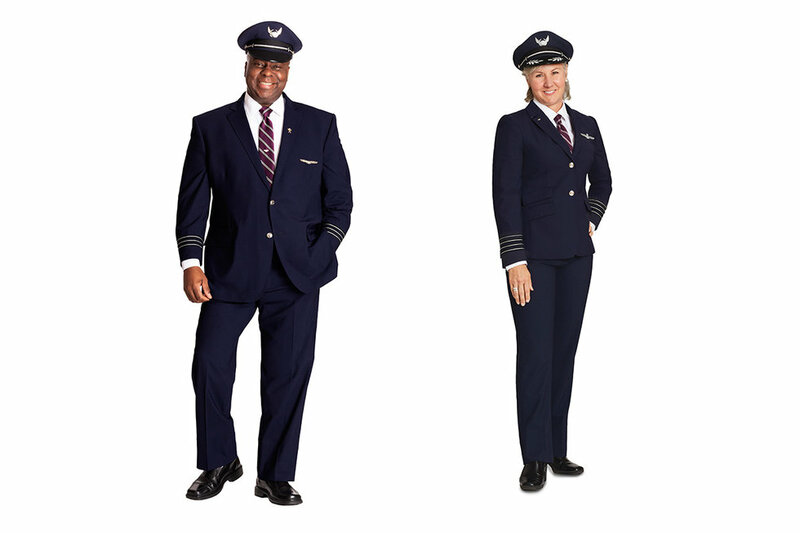 United has unveiled new uniforms for more than 70,000 employees. My reaction as armchair fashion critic is a big sigh. I wrote about the new uniforms back in 2017. That was just after the Dao incident and the title of my piece was United Airlines Needs Customer Service, Not New Uniforms. Well, it is two years later and I’ll give United a lot of credit for greatly improving customer service over that period. Even so, I’m not a fan of the new uniforms. United has certainly earned the right to introduce new uniforms. Furthermore, the uniforms above are just being trialed, they are not the final product. 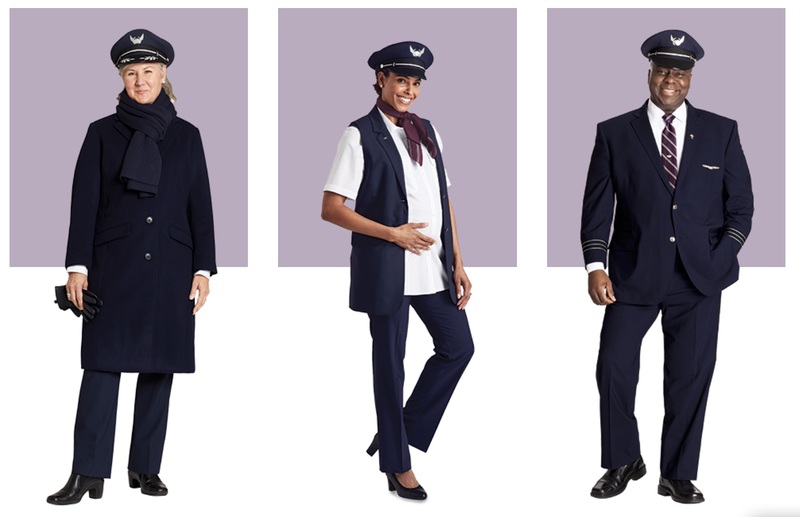 But Walmart-style vests are not fitting for pilots and those horrible purple shirts or athletic striped sweaters for flight attendants are not befitting of a leading carrier. At least that’s my two cents. Then again, I’m resistant to most change so maybe these new uniforms will eventually grow on me. What do you think about the new uniforms? Isn’t that the uniform pilots have been wearing since the 80’s? The articles are still midnight blue as before, but the tie is different and the brass and strips have changed from gold to silver. You can’t really do much with pilot uniforms. I don’t like the new necktie colors. I just don’t understand why the change on those, except for the sake of change. They are the ugliest things i’ve ever laid my eyes on. Cheap looking and not professional at all. Who is going to wear a Poncho thing to work? Totally unsafe and unrealistic! The draped dress for the FAs is amazing, as is the all-navy dress, which I assume will be the ‘first class’ uniforrm. The rest is uninspired. There’s ‘comfortable in style’ and then there’s ‘hung over at the drive-thru’. I find some of the FA attire to be the latter. The solid navy dress is maternity! There’s gonna be a baby boom at United! Same angry employees dressed up in new threads. BFD. these aren’t winning trophies at Paris and Milan anytime soon but they’re okay – “B” grade in my book. Is purple the new color for United?? These are WORSE FA uniforms than existing. Color coordinates with the Premmium economy seating on plane seat map. Purple and blue? Sounds like a bruising. I agree doorman… I don’t like them. Please back to the drawing board! I like all of them, including the athletic striped sweater for the male FAs. Lavender’s a tough color to incorporate without it looking cartoonish, but they did a great job. And if a pilot can wear a short-sleeved dress shirt (which I think looks fine, BTW) with a tie, what’s wrong with a vest? Barney! I love you, you love me. Space, the final Frontier…these are the voyagers of the starship…United? I see the male cabin crew are in school blazers like I wore in the 1960s. Poor them. While I mostly don’t care what they wear as long as they give good service, I do think it’s nice they are also updating the Ramp Service folks clothes. the Carhartt move is nice. Respected brand, right position. I like the ideas of the others and I’m sure they’ll be refined. Male uniform is doorman like. Uninspiring. Please redesigned. Right off the bat I an bored. I like that they used Carhartt for the ramp stuff, that makes it tough and practical. I think the FA and pilot gear is fine though the vest thing is a little weird for the pilots, I agree- I like them to look kind of formal. What I don’t understand is the customer service folks suddenly showing up in that light blue/teal kind of color. Looks weird, doesn’t fit with any of the other colors, imho, of the rest of the crew. Overall the style of the FA outfits is nice, especially the women’s wear. Super cute details that make an impression. I still think Delta wins hands down on the redesign competition- when you see those folks walking through the airport, they look SHARP. And I’m a United person. 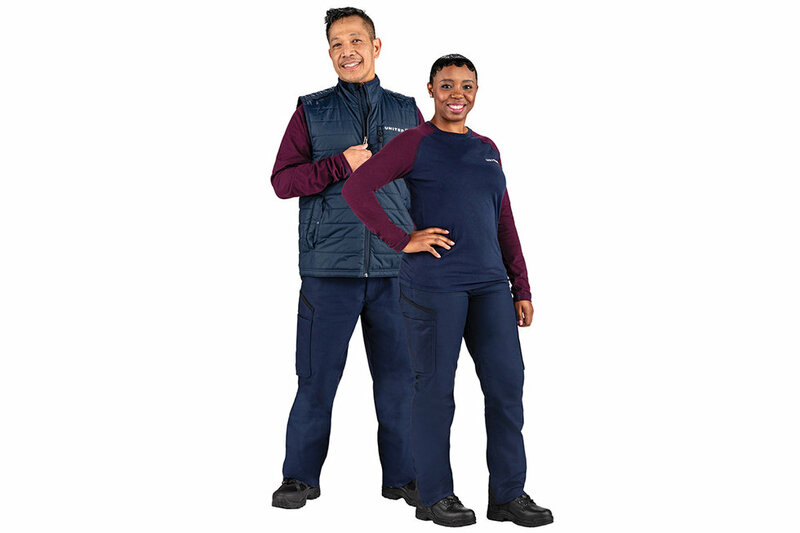 Love that new retro pajamas that united is providing to employees to work on. I’m really impress by the cuture and color coordination. Always the best in service, arriving and departing on time and costumer service. United is the leader in cookbooks and now in fashion. Overall, I like them, though I’d prefer less blue (too generic). A bit QANTAS-esque . Way, way, WAY too many female FA uniform variations. The brand message is already confusing as they’re incorporating purple – unless they’re going to introduce to livery/branding across the entirety of the fleet and airline itself. But now they’ve given far too many options for FAs. Same for the male FAs, too, but to a lesser degree. For me, it doesn’t inspire a whole lot of confidence in an airline to see a 777 crew all wearing different but “authorized” versions of the same uniform. Heck, the term “uniform” implies consistency, which is exactly what we aren’t seeing when there’s so many ways to dress. No other carriers outside the US have this problem. Further, UA doesn’t empower lead FAs or pursors to enforce a specific uniformity among the crew; they all just show up for pre-brief in whatever Hefty bag they pulled out of the laundry basket that morning. 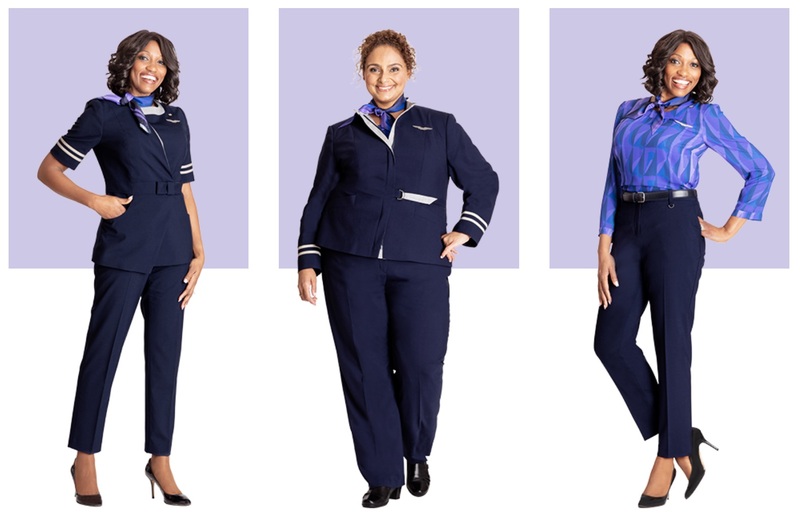 Seeing the plus-sized FA uniforms only confirms the lie that flight attendants are there for your safety. I’ve been on plenty of commuter flights where the FA could not walk straight down the aisle due to his or her size. Not exactly a plus if there needs to be a quick evacuation or assistance. The uniforms themselves are non descript. And purple. Don’t like the highlighted lapels and sleeves on some of the jackets; other than that they look great. The purple gives a lift and is perfect. Ouch….my eyes are still hurting from the male FA’s uniform jacket. Paging Captain Kangaroo….STAT. Not every female FA looks good with a shirt tucked in or with a belt around the waist. There appear to be few options unless you wish to wear a purple-esque mumu. Maybe it’s a good thing my wings are permanently clipped. At least when I flew, we looked professional….and we had the uniforms that fit the bill. I am Not a fan. What’s up with the purple and casual wear? We are dumbing down society’s work attire now? They should keep their high class look they currently have. Navy is spot on. We fly United quite often. I’m not impressed with the purple color choice as well as some of the style options. The Aqua blue color is very appealing and I would much rather see the the Flight Attendants wearing this “happy”color during my time spent on the plane. Why was this color chosen/given to Customer Service/Gate Agents instead of the FA’s. Or at least incorporate the aqua color in more options/choices for the FA’s as well. I also like the dress (which is a true Qantas rip-off), the sweater and the blue/purple printed blouse. The rest of the uniform is quite boring. The male uniform is nothing special. I don’t like the white piping on the jacket. There is too much going on! What is wrong in the USA? 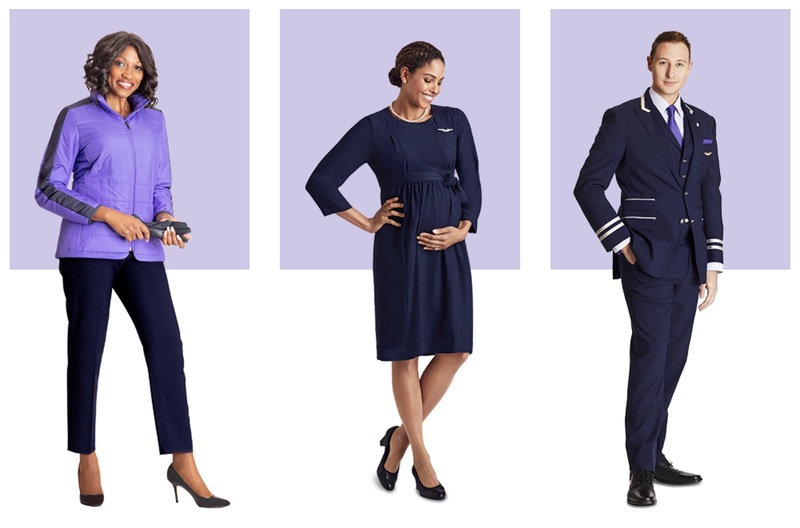 It seems that US airlines and designers are not able to come up with nice uniforms anymore. Everything looks the same and everything looks boring. Since the 1980s airline fashion in the US has been dreadful. 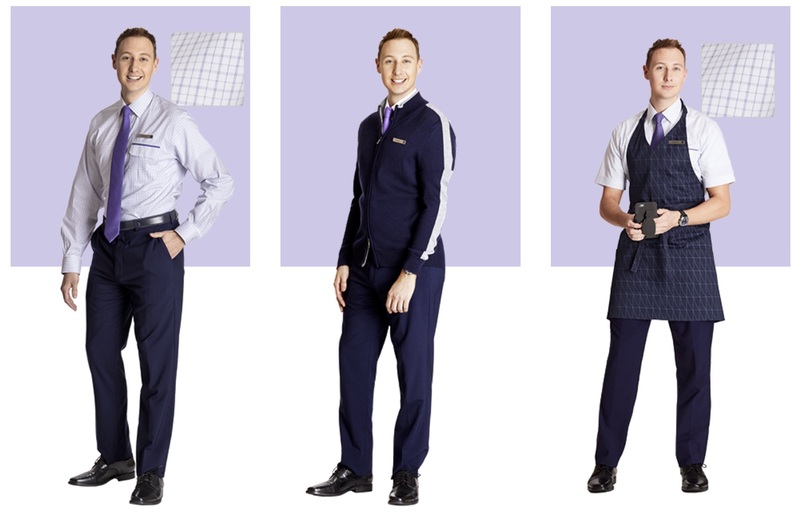 Look how airline crews are dressed in Europe, South America, Middle East and Asia. Maybe it is time for US airlines to let foreign designers create a new look for them. Oh that belted dress on the middle flight attendant, then the hideous bright blue blouse? How much did Tracy Reese get paid to make that poor woman look that bad? And the male flight attndant jacket? Oh no no no no no no. Having flown with United Airlines for over 35 years as a loyal customer. I have never seen a uniform as unprofessional and less classy attire. When you enter the airport or enter the aircraft you want to feel your front line and crews look professional, sharp with classy appearance where they feel proud to wear a uniform that stands out and above all industry standards not something that will not work for every figure. The version Not only is it less than attractive on the general masses it has nothing to do with looking professional on anyone. Tracy Reese may be a fashion designer, but she never took time to find out what these people do for a living. She should have looked at clothes that will move with the individual on a daily basis. These clothes look like wal mart clothes. I doubt if wal mart would sell them. Those uniforms are hideous and the flight attendants ive spoken with hate them! Desctived as Amish and Star Trek meet 80’s rainbow skating. What were you thinking? Why do people have to mess with a classy uniform? They are hideous, cheaply made and very unprofessional. I want to look like a Flight Attendant, not someone going to a seminar. Solid colors, like navy or midnight blue……please and buttons on the blazer, not straps with buckles!!!!! They lack taste, class and quality! Start over, please!